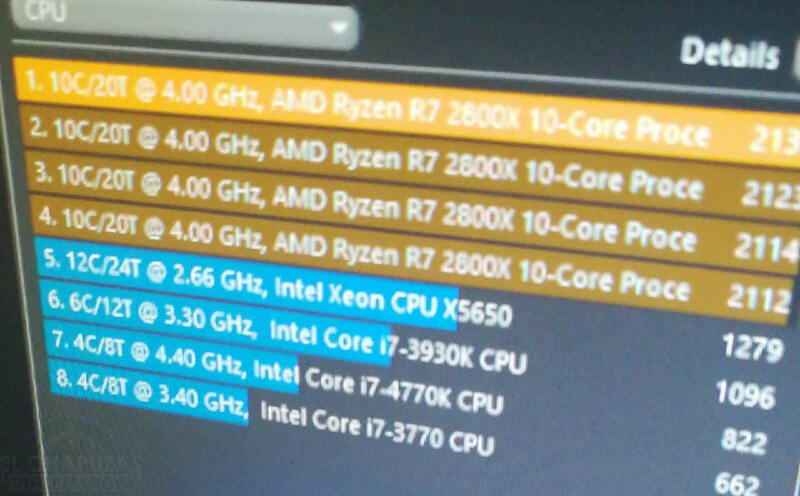 El Chapuzas Informatico has leaked what they claim is the Cinebench score of a Ryzen 7 2800X. However, several inconsistencies within the screenshot of the score and the idea of a 10 core Ryzen CPU reveal that this leak is almost certainly a fake. While it can be exciting to discuss the veracity of certain rumors in the tech industry, one has to be able to exercise caution in believing in them, as well as being able to reasonably deduce that one supposed leak might be fake or somehow inaccurate. For example, while the Turing leak from last month ended up being mostly true, some aspects ended up not being the case. Leaks might be outdated or misunderstood or outright forged. In this instance, it is likely that this Ryzen 7 2800X leak is the latter. 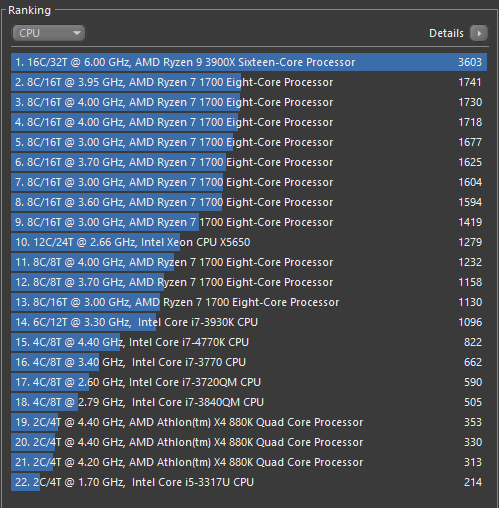 Spanish tech website El Chapuzas Informatico leaked this screenshot of a table of Cinebench scores, one of which being labelled as the “AMD Ryzen R7 2800X 10-Core Processor.” While the 2800X has been a rumored CPU for some time, there are several inconsistencies within this screenshot that will encourage one to conclude that this leak is either inaccurate or entirely faked. Cinebench has naming conventions for AMD and Intel. For most Ryzen CPUs, the nomenclature is as follows: “AMD Ryzen [3/5/7] xxxx[X] [Spelled out number]-Core Processor.” For example, an R7 1700 would be the “AMD Ryzen 7 1700 Eight-Core Processor.” Please note that this leak has “R7” instead of “7,” making the R7 redundant because R7 means “Ryzen 7.” Note also that this is apparently a “10-Core,” even though it should say “Ten-Core” if AMD and Cinebench have not changed the nomenclature. These reasons alone might be enough to say that this leak is false, however there is a far more important reason this leak has little credibility: there is no 10 core Zen design, and there might never be one. The Zen architecture is designed on one die, and that die has 8 cores divided into two core complexes (CCXs). Each core complex has 4 cores. In order for a 10 core Zen CPU to exist, it must have 5 core CCXs. It is not possible for AMD to create a CPU with 2 normal CCXs and an additional CCX with 2 cores, all CPUs must have symmetrical core designs if two CCXs are used. Ultimately, as long as no 10 core Zen design is within the public sphere of knowledge, this leak will have little credibility as a valid source of information. Finally, it is actually very simple to fake Cinebench scores. For example, this fake Ryzen 9 3900X score was created easily by editing a Ryzen 7 1700 score’s text file, which is stored locally on the machine. But online services like 3DMark can also be fooled by custom drivers, registry edits, or a number of alterations. It is good to research every leak individually and evaluate whether or not they might be true or false. This was faked by simply editing a text file in Windows.